A doctor dabbles in magical resurrection with horrific consequences in this supernatural thriller adapted from the novel by Stephen King. When Dr. Louis Creed (Dale Midkiff) and his family move from Chicago to an old farmhouse in rural Maine, their only concern is the busy highway that flanks their new home. 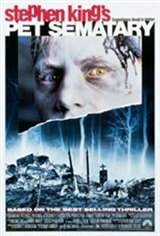 Louis' family -- wife Rachel (Denise Crosby), daughter Ellie (Blaze Berdahl), and toddler Gage (Miko Hughes) -- soon meet kindly old duffer Jud Crandall (Fred Gwynne), who introduces them all to the local attractions, including a pet cemetary built on the remains of a Native American burial ground. When Rachel and the kids head off to visit Louis' in-laws, Ellie's cat gets flattened by a truck. Jud counsels Louis to bury it in the old Indian portion of the cemetary; the next day, it returns from the dead, carrying with it the stink of the earth and a decidedly bad attitude. Shortly thereafter, Louis is tempted to use the cemetary's magical powers again when his son suffers a tragic accident. A snarling kitty, it turns out, is nothing compared to the horror of a little boy with no soul and a taste for scalpels. In addition to adapting his own novel for the screen, writer King appeared in a brief cameo as the minister presiding over Gage's funeral. Director Mary Lambert would return with Pet Sematary Two.